MILAN -- Fiat Chrysler Automobiles said third-quarter net profit rose to 910 million euros ($1.1 billion), up from 606 million last year. Adjusted earnings before interest and tax (EBIT) for the quarter rose 17 percent, while revenues were down 2 percent to 26.4 billion euros. EBIT for Europe, Middle East and Africa rose 22 percent to 127 million euros in the quarter while net revenue fell 2 percent to 4.98 million euros, FCA said. European vehicle shipments were down 3 percent to 285,000 as lower UK sales and a decline in commercial vehicle sales in Italy was only partly offset by higher sales of the new Jeep Compass and Alfa Romeo Stelvio. In the UK, Fiat brand's new-car sales slumped 42 percent in September in a market down 9 percent as weaker consumer confidence, partly due to uncertainty around Brexit, deterred buyers. EBIT for the U.S. and the NAFTA region rose slightly to 1.29 billion euros from 1.28 billion euros. Revenue in the region fell 4 percent to 16.13 billion euros. Vehicle shipments slipped 6 percent to 592,000 units. FCA still makes the lion's share of its profits in North America so improving, or at least maintaining, its margins there is a key focus. The carmaker reported an 8 percent adjusted operating profit margin in the region, up from 7.6 percent a year ago, despite a drop in sales and shipments. 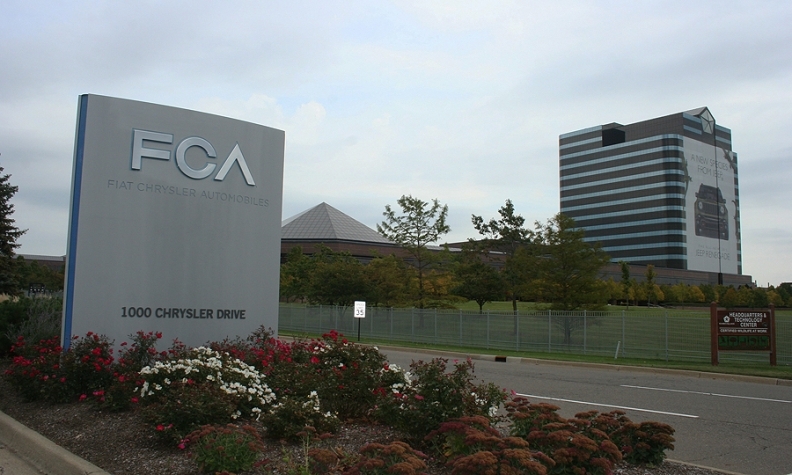 "FCA's profitability in North America remained strong in the quarter despite a weakening market there," a Milan-based analyst said. FCA has been retooling some U.S. factories to boost output of SUVs and trucks while ending production of some unprofitable sedans to strengthen profitability as the U.S. car market comes off its peak. The company said a drop in North America shipments due to lower fleet sales and discontinued models was partially offset by higher deliveries of RAM trucks and the Alfa Romeo Stelvio and Giulia. FCA's profitability compares with an 8.3 percent North America margin reached in the quarter by bigger U.S. rival GM , showing CEO Sergio Marchionne making progress towards his goal of closing the margin gap with GM and the company's other U.S. rival, Ford, by 2018. Quarterly EBIT at Maserati rose 10 percent to 113 million euros as higher shipments of the Levante SUV largely offset lower Quattroporte volumes, FCA said. Maserati's net revenue fell 6 percent to 821 million euros primarily due to negative foreign exchange and lower shipments to China. The automaker's net industrial debt rose to 4.4 billion euros by the end of September from 4.2 billion three months earlier due to currency effects, but was still lower than expected by the market.